I wanted to let you know about a HUGE sale that is going on this weekend! I mean, so huge that we are talking over 150 titles available and they are all either $.99 or FREE! *screams excitedly* There are also a long list of paperbacks for sale at incredibly discounted prices as well! They are all clean reads! There is also an amazing giveaway going on too if you would like to enter. 😉 A grand prize winner will receive 20 paperbacks and a 2nd place winner will get 20 e-book titles from the sale. Awesome right? Giveaway runs from November 22nd till November 26th@12AM ET. Grand prize open to US winners only. 2nd place prize is open internationally. Now the fun doesn’t end here! I’m also interviewing the wonderful C.S. Johnson (who I interviewed a few months ago concerning her release of Kingdom of Ash and Soot). – Hi CJ! So excited to have you back on Unicorn Quester! I thought I would shake things up and do book-related questions. 😉 For my first one, how would you describe your reading taste? Eclectic. I read a lot of light and fluffy things when I want to relax, and I read a lot of deep and meaningful things when I want to be challenged. – That could wrap up my readying taste too, though I tend to find the deep, on edge fiction all the time. Haha! You’ve suddenly been teleported into a dystopian book world! What kind of character do you think you would be? Fight the government in every way possible or do what you’re told until the time is right? No way, haha. It’s a nice fantasy, if you don’t actually have to live that. I’ve been to a gun range enough to know it’s going to be a long time before I’m accepted in a fighter squad. I’d probably end up more like a handmaid, where I’m used for breeding. I think in some ways I would be okay with this, too, because they would have to take care of me if they wanted the human race to continue, and I would be able to sleep and eat as needed, and as a carrier of the next generation, I might be able to swing it to where I would have some say in how they are raised, etc. In the downtimes, I would be able to be a scribe and write the history of the new world. I think I would enjoy getting to tell my side of the story that way. – Oooo! Very excellent point! Since I’ve gotten pregnant, almost every book I’ve read has made me at least tear up. Haha! Do you remember the first book that made you cry? If not, what was the last book that made you cry? I’m sure there are a lot of books that have made me cry – and more since I’ve been pregnant, too, so I know exactly what you mean! 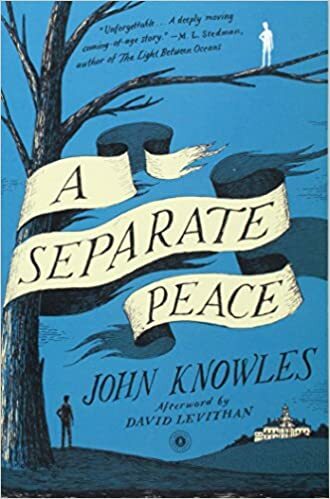 But the book I remember crying the most over was A Separate Peace. It’s no one’s favorite book, but I absolutely loved the book as a teenager and I loved teaching it in high school. Finny and Gene’s friendship is absolutely wonderful and Finny has stayed with me over the years so much. Much of his character’s influence can be seen in many of my male protagonists and characters – Hamilton’s exceptionalism, Ferdy’s irreverence, and a few more WIP characters I’m working on. – I feel this can be a big debate with readers and curious which one you you prefer to read: Standalones or series? I feel this is a question that is dependent on the book itself. I’ve read great books that I can read over and over again – Till We Have Faces is my favorite book and I reread it at least once a year. But there is no way to get a series out of it. I think if you’re going to hedge your bets, standalones are more consistent for that mix of satisfaction/dissatisfaction. But I think you can only do some things with series, and that’s why I enjoy writing series. As a writer, I like writing series better than standalones, because I like being able to show people not only what “happily ever after” looks like, but “after-happily-ever-after” looks like, too. While I certainly appreciate the fantastical elements fantasy and epics provide, I do believe that in today’s world, it’s important to offer people something more real that they can take away and use in their own world. Several of my favorite books have inspired me and their characters have given me courage to do the right thing when it was not the easy thing to do. I’ve also had characters that have shown me what not to do, too, and that can be just as important sometimes. – The book I’m currently reading it very much showing that. It’s been a little tough reading because it would be nice if they could stay at that “happily ever after,” but then you bring up a good point about being able to take away from the story and apply it to our own world. Great insight! For my last question, I LOVE how fiction can inspire us to think differently about life. It makes us ask questions or reconsider situations. What’s the last book you read that inspired or encouraged you to think differently? This is a great question that ties into my last one some, too. 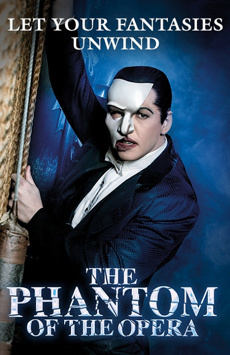 This week I have been able to go and see The Phantom of the Opera on Broadway with my friend Faith. I’ve always loved the music to it so it’s still running through my head, even days later. I really liked getting to see it in person and it made me appreciate a lot more about how we see ourselves and how others see us, especially when it comes to building relationships. This time, it really struck me how Phantom in the story, the first time Christine unmasks him, earlier on in the film, says that it was too early for her to discover the truth about his face. At the end, when she shows him the sort of love he was always denied, they both have a chance to see what their love could have been if she had truly fallen in love with him. It’s such a good parallel for today’s world of social media – how do we really know the people that we befriend over the internet, and is there such a thing as getting too open too soon, before we ruin relationships, and is it able to be redeemed? I think about this sometimes with my own soul’s deformities, if I am too open about some of my open wounds. Can someone really befriend me knowing certain things about me? And then, there is the other side to consider, too. Can I befriend someone knowing certain things about him or her? It’s never the same person to person, of course, but the Phantom really only had one person to gamble on in the story. In today’s world, we face that every day as people read our books, our blogs, check out our social media, etc. I’m stuck on wondering – both kinds of wondering, haha – at that, because Faith and I actually became good friends over the internet and it was so much fun getting to hang out in real life. – Those are really good points! I know I’m thankful for your friendship and befriending me. <3 Thanks so much for chatting with me, CJ!